Let’s remember some of the things that made January 2008 a great month at Unclutterer.com. On January 6 we celebrated our one-year anniversary! Speaking of del.icio.us, we established a share a link system where you can point us to great stories through their site. Just go to http://del.icio.us, and mark your suggested link “for:unclutterer” (without the quotes). If you own an iPhone or iPod Touch, you can now have an Unclutterer icon on your phone’s desktop. We were discussed on the Encyclopedia Britannica blog. The closest we’ve come to being IN an encyclopedia. More than 598 people have joined our Unclutterer flickr group. There are more than 228 photos uploaded to the group, and we look forward to seeing your additions! 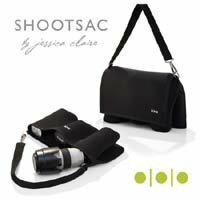 Specifically, she realized that while on a shoot, she almost never had to put her camera away, but she always needed to change lenses — so why not make a bag designed for that task? The ShootSac was born. Even with the extra lenses, it was more comfortable than my normal bag — the center of gravity is much closer to the body, allowing weight to be better distributed. During a shoot, I usually unhook my bag, put it down, and keep running back and forth. That was never an issue now. Unitasker Wednesday: How would you like your eggs? If your answer to the title question is, “With as much fire power as possible,” I may have found an item for you. Have you ever eaten eggs in the shape of a .45? 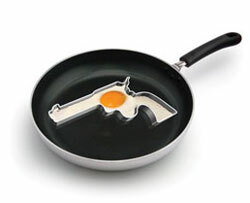 Well, now is your chance with Gun Egg Fryers, brought to you by the lovely folks at UrbanTrend. In my quest to find ridiculous unitaskers, I often come across questionable and weird products. The Gun Egg Fryer is very perplexing to me and fits into the questionable category. Does food in the shape of a firearm taste better? Are the Gun Egg Fryers part of some bizarre national trend? Maybe weapon shaped food is the next big thing for 2008. Can you please pass the bazooka shaped pepper mill? Sure, [dried] spices last a long time, but they don’t last forever. Some spice companies have online freshness checkers: Durkee, McCormick (with a sense of humor, to boot! ), and Spice Islands (registration required). It looks like most dried spices maintain their freshness for one to three years. I love on the McCormick site where it says, “If it’s from Baltimore/a tin, it’s at least 15 years old.” Riotous. If you are an owner of an iPhone or an iPod Touch, you can have Unclutterer as a snazzy link right on your main desktop. All you need to do is open the Safari browser to our site, click on the plus sign at the bottom of your window, and then choose “Add To Home Screen.” In 30 seconds or so, the guy vacuuming his face should appear on your desktop for one-click access to Unclutterer.com. “People are buying fewer CDs every year,” Mendel says. 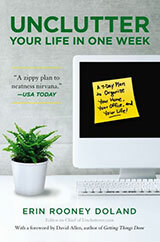 “You don’t want to wait until those sales are finished, before you find a way to run your band. 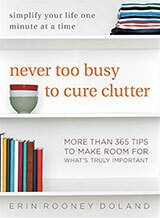 Maybe Nate would be interested in our post on eliminating CD clutter. Here’s another rock star who enjoys simple living. Keeping track of all the different passwords I have for accessing online content is a bit ridiculous. Just this morning, I had to initiate passwords for three different sites. Yeah, I have auto complete for some of them, but not for the more sensitive sites like my bank account. If you find that you are a bit overwhelmed by all of the passwords you have and are using a Mac running OS X, you may want to check out 1Password. 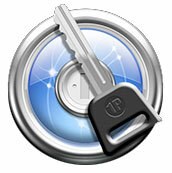 Manage hundreds of passwords with one master key. Automatic form filler outclasses the other AutoFill products. Prevent phishing criminals from stealing your information. OS X Keychain integration provides maximum security. Integrated with Safari, OmniWeb, DEVONagent, Firefox, Camino, and Flock. Define multiple identities to be used by the form filler. 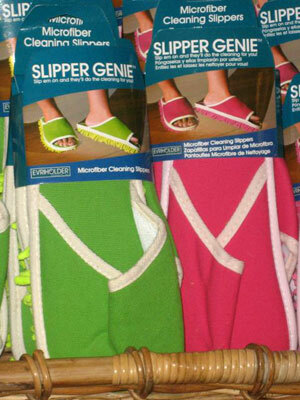 The Slipper Genies have microfiber, mop-like soles that are supposed to clean your hardwood, tile, and smooth surface floors as you walk around your house. The bottoms come off and can be thrown in the washing machine. In theory, I think they’re a lot of fun. In practicality, I think they could be a little troublesome. I’d be worried that I would fall and break my neck because of a lack of traction on the soles. In a less dire scenario, I’d worry about making the mistake of walking on carpet or an unknown wet spot and leaving a clump of dust. Also, there’s the fear of unknowingly catching something like a rock in the sole and scratching up my floors. However, life is full of things to fear that are more probable, and so the Slipper Genies may be worth buying and used wonderfully in your home. It’s definitely a product I would love to hear reviews about in our comments section. My 98-year-old paternal grandmother loves National Geographic magazine. When we helped move her into a one-bedroom apartment in a retirement community a few years ago, I was shocked to discover that she had been saving every issue of the magazine for more than 30 years. The collection (stored in dozens of cardboard boxes in her attic) contained somewhere between 400 and 500 monthly issues and special printings. I try not to think about how quickly those boxes of magazines could have burned in a house fire and am glad that such an accident never happened. Unfortunately, all of the time, effort, and space my grandmother sacrificed to keep her collection was superfluous because the last 112 years of National Geographic magazines are now available on 32 CDs. I would prefer that they appear on DVDs, but 32 CDs still take up less shelf space than thousands of the yellow border magazines. This isn’t the only magazine to undertake such an endeavor. The New Yorker (8 DVDs) and Mad Magazine (1 DVD) are just two of many magazines to publish their decades of collections. And, the digital collections don’t stop with magazines. Marvel Comics has also released many of their publications in complete collections, like Spider-Man (1 DVD), X-Men (1 DVD), Incredible Hulk (1 DVD), Iron Man (1 DVD), Ghost Rider (1 DVD), Fantastic Four (1 DVD), and Captain America (1 DVD). If your favorite magazine isn’t on CD or DVD yet, I still stand by my previous suggestion to scan your favorite articles and file them on your computer using DevonThink, Yojimbo, One Note or a personally created digital filing system. What speaks to me about this office is that the choices of white, black, and glass objects make it so that the work, in this case the computer monitors, are at the center of attention. 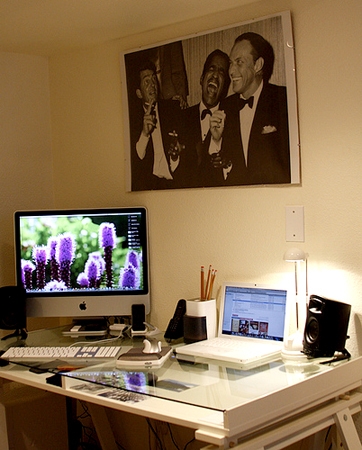 There isn’t anything visually cluttering up the space or distracting from the work. A person could really think in here. Additionally, with the desk and light both being Ikea pieces, I like knowing that other readers could recreate this design without feeling too hefty of a hit in their pocketbooks. How incredibly convenient — a personal, portable microwave! Forget all those trips to the kitchen or treks to the cafeteria — now you can reheat coffee right at your desk; or nuke some soup for your brown-bag lunch; or pop some `corn in the entertainment room. Plug it in anyplace that’s handy — work or home office; home gym; family room; nursery; wet bar; dorm room; work bench; pool house, everywhere! The quiet, super-energy-efficient iwavecube measures just 10″ x 10.5″ x 12″ and weighs only 12 lbs. 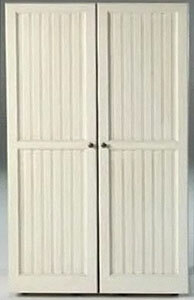 Features a built-in carry handle and view-through door. The next time I’m rocking my daughter to sleep in the nursery, it will be great to have corn popping right next to us. That will certainly help her nod off to dream land. Less walking and more popping in 2008!